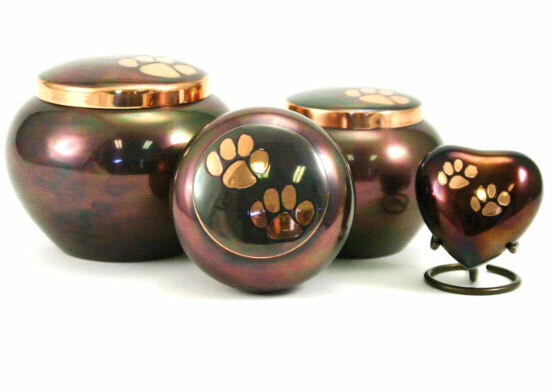 The Raku/Copper Paws Pet Urn is a solid brass urn with large paws on the lid to remind you that your beloved pet has forever left a paw print on your heart. The main coloring will be brown with copper colored paw prints, but since this is a faux raku finish, there will be other colors as well to mimick the raku process used in ceramics. Lids are threaded for a secure closure. It is important to keep the cremains in a sealed plastic bag inside any urn, even one with a secure closure. Engraving is available for an additional fee. Please limit engraving to no more than 20 characters (all letters/numbers/punctuation/spaces) per line. Click on the tab titled Detailed Images to see samples of the engraving fonts. As with any urn, it is highly recommended that you keep the cremains in a sealed plastic bag inside the urn. Please allow 10 cubic inches for this plastic bag when considering which size urn to purchase. Industry standard for determining pet cremains is 1 lb of healthy pet weight = 1.5 - 2 cubic inches of cremains. Please allow 1-2 business days for engraving before urn ships. Nonengraved items usually ship one business day after order is received. Ships from the Midwest.